Filled with charming characters and genuine emotion, a wonderful family movie that shines a light on the truly important things in life. Christopher Robin is the second film in as many years to showcase the dynamic relationship between the real-life Christopher Robin (Milne) and his beloved stuffed animals through trying times. While last year’s Goodbye Christopher Robin focused more on actual events, this new film is pure escapist fantasy, a mix of live-action and CG animation combining the heartwarming and life-affirming nature of A. A. Milne‘s original stories with Disney’s animated Pooh adventures. The results are a film filled with loads of English charm and just the right touch of predictability that’s sure to delight younger audiences and warm the hearts of older crowds. Directed by Marc Forster (Finding Neverland, World War Z), the film starts with a young Christopher Robin (Orton O’Brien) who lives in the Sussex countryside. Here there’s a tree on his family’s property with magical a door that acts as a portal to the mystical Hundred Acre Woods. It’s through this portal where a young Christopher Robin meets up with his animal friends, Pooh, Piglet, Tigger, Eeyore, and Rue. Sadly, Christopher Robin has to grow up, too quickly by all measures, when he’s sent away to a boarding school. Shortly after, his father passes away, leading Christopher to distance himself further from his childhood ways – and friends. Years later, a fully grown Christopher (Ewan McGregor) meets his wife, Evelyn (Hayley Atwell, Captain America), and it’s not long before they have a daughter, Madeline (Bronte Carmichael). As often happens with adults, the more time that goes by, the more jaded Christopher Robin becomes. 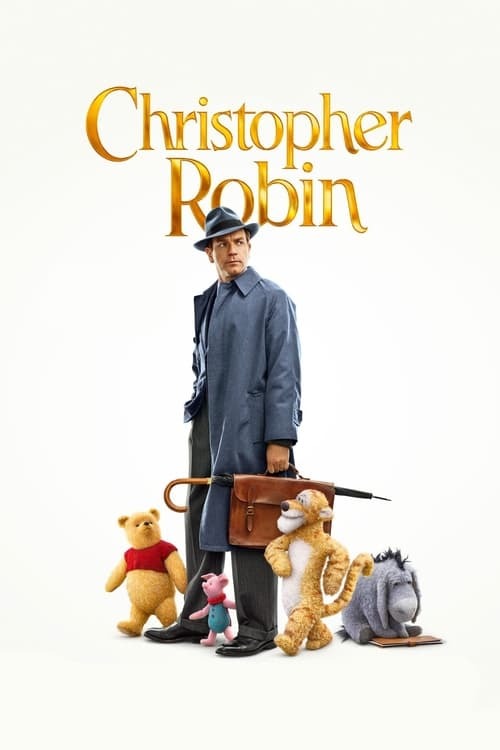 After a few years fighting in the army during World War II, Christopher Robin is sent home with and a broken arm and quickly becomes an efficiency manager for a large luggage company. It’s here where his boss, the owner’s son, informs him they must cut spending by 20 percent to avoid the company going bankrupt. Distraught at the thought of firing his employees, Christopher Robin sends his family to the country while he says behind to work. Something he has done throughout his daughter’s life, and Madeline is quite upset. Meanwhile, in the Hundred Acre Woods, Winnie the Pooh (Jim Cummings) has lost all his friends, convinced that a monster, which they call a “Heffalump”, has captured them. He decides that Christopher Robin is the only one who can help save them. He embarks on an adventure through the magical door in the tree, ending up on a park bench in London where – as it happens – the older Christopher Robin is hiding from a petulant neighbor who wants to play cards. And so our story truly begins, one filled with wild adventures, funny moments and engaging dialogue that will have audiences in stitches, surrounded by moments so sweet and precious that will make audiences melt. Critical to this is how lovingly the different eras are presented, thanks in part to Matthias Koenigswieser’s beautiful cinematography, the Hundred Acre Woods scenes filmed in Windsor Great Park and the London scenes offering a perfect contrast to the fantasy world elements. Ewan McGregor’s performance is fantastic, though I found it hard to believe a grown man was actually talking to stuffed animals that spoke back to him. Pooh was Pooh, brought to life with wisdom and care by Jim Cummings’ poignant performance. The rest of the cast provided just the right touch, with Eeyore (Brad Garrett) being the most entertaining of all, with his fatalistic and depressive point of view immediately familiar. Fans will be happy to know the diminutive little Piglet (Nick Mohammed) is just as sweet and nice as everyone remembers. Christopher Robin and Winnie the Pooh were the most developed characters in the movie, while the others truly took on more supporting roles, and were simply there for encouragement of the leads’ characterization, to help move the story forward or provide comedic relief. The best comedic moments came from a long line of “broken telephone” type dialogue involving Christopher Robin saying something to Pooh and Pooh repeating it using a completely different word or idea. These great moments really added to the charm and innocence of the film. Whether out of nostalgia or a longing for wholesome stories, Christopher Robin is filled with charming characters and genuine emotion, a wonderful family movie that shines a light on the truly important things in life, like family, love and play. Those with fond memories of Pooh and his Hundred Acre Woods friends will be thrilled to see them recreated as stuffed animals, a perfect nod to A. A. Milne’s iconic teddy bear and other beloved toys. More than that, it’s a nice escape from reality for adults who may have forgotten just how important it is to enjoy the time you have with the ones you love most.